The light in our lounge is pretty dim, really we should replace all the lights with better ones but we're waiting to redecorate everything at the same time. The idea suddenly hit upon me that I should replace the shades with something better (and laser cut). 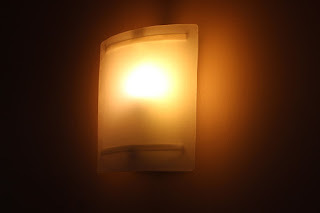 The old fittings basically block out a large chunk of the light being produced so I copied the size and shape but reproduced them in semi transparent materials. The new light fittings, three of them, allow much more light to actually enter the room making it appear much brighter. The fittings were made from 6mm clear acrylic which was double stacked for strength. Double sided carpet tape was placed around the edge to affix the polypropylene to the front. Simple but effective.